Are your board committees working? Or are they rooted in traditions that grew out of past necessity but have lost their relevance in today’s context? Are they helping or hindering your board? 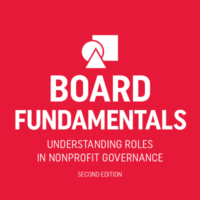 All the information you need to know about board structure, common standing board committees, and advisory groups in one volume. Do we need this committee? What are the roles and responsibilities of each work group? How do we set up our committees for success? Who should serve on our various committees? How do we assess our committee’s effectiveness? 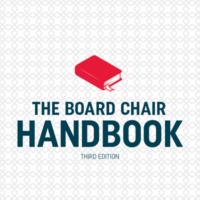 BoardSource’s current thinking, recommendations, and policies regarding board structure. Data from BoardSource’s most recent research as it relates to committees. 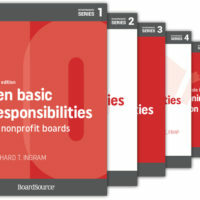 Clear, concise text for busy board members. We encourage all boards to be creative in rethinking how your board might be structured, and be flexible in experimenting with different strategies. 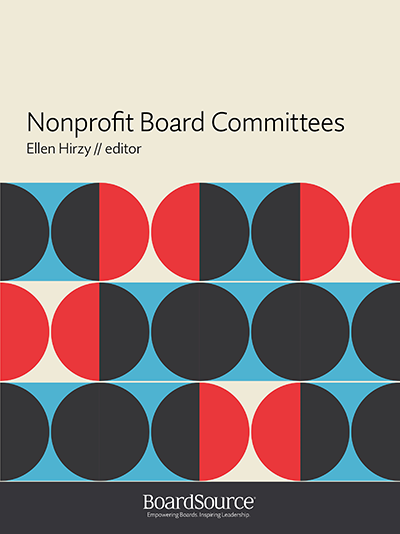 The place to start is Nonprofit Board Committees. Please note: This new publication replaces a series of six books that were collectively known as the Committee Series. 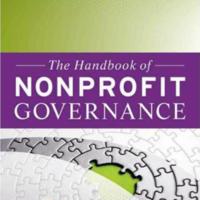 Much has changed in governance and the world in which nonprofits operate since those books were published almost 15 years ago, all of which is reflected in Nonprofit Board Committees.